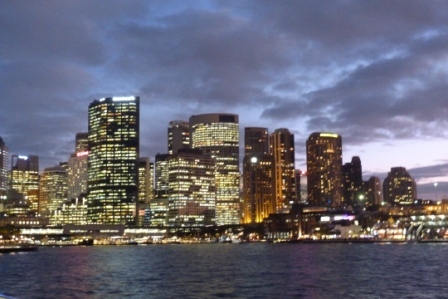 What to do and Where to go in Sydney Australia. First of all, remember, You Can’t Do It All. So take a deep breath because there is much to choose from if you’re only here for a few days. Grab a map from the hotel. Get dressed up a bit (look I am a country bumpkin), put your walking shoes on, and Enjoy. I have no doubt that you will. The sails of Sydney Opera House turn pink at sunsetAhh, such icons. I’m not going to rabbit on about their history, you can look that up anywhere. But I will tell you about the light at sunset as the sails of the Opera House turn a delicate rosy pink– heartbreakingly gorgeous – and I should mention the welling up of tears you may experience as you set eyes on the Opera House and The Bridge for the first time. Call me soft, but by the time we’d stopped taking photos my mascara had run all down my face. I blame it on the breeze. Circular Quay is where all the ferries chug out from. It’s a happening place, and the harbor is buzzing with boats. You can walk from here to the Opera House, where there are a posse of harbourside restaurants jostling for al fresco space. Take some to enjoy the sensational watery views, and of course maybe take the chance of booking a tour around the innards of the Opera House. A walk around the 30 hectares of the leafy botanic gardens with their vast collections of plants and trees is like salve for stressed souls. Established in 1816, they are quietly idyllic, like a breathing lung connecting the city to the sea. When you reach the lower gardens the harbor, the bridge and the opera house all merge into one technicolour view. Tread in the footsteps of a Governor’s wife and walk around Farm Cove to Mrs Macquarie’s tranquil look-out point , and imagine what it must have been like in 1788 when the First Fleet carrying over 700 convicts landed here. Don’t do what I did and buy the wrong ticket. After the zoo, I found myself In an undignified position, having a hissy fit, chucking out the contents of my overstuffed handbag onto Circular Quay, first in an effort to find the tickets to re-board the boat and secondly to be told they were the wrong ones. This is not the way to go – especially when your 20 year old daughter is standing by and tut-tutting about the disgusting contents of your bag. 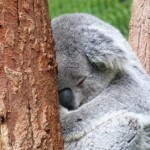 Buy the right ticket, and give yourself at least half a day to have fun at the zoo and perhaps hop off for lunch at Watson’s Bay or Darling Harbour. 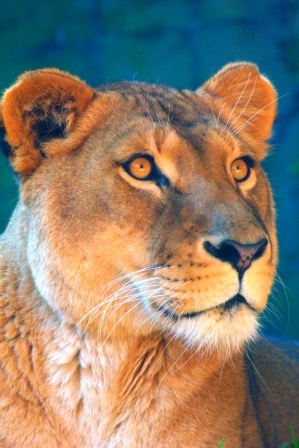 I’ve been to zoos in some countries where I’ve come away distinctly disheartened. 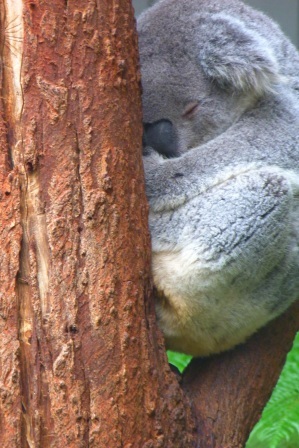 Would Taronga leave me disappointed? Not at all. I found myself squealing with childish delight, chuckling at the animals’ antics – animals which looked healthy and cared for. As for my 20 year old daughter – well, I could have sworn she went back to being 6 years old again. 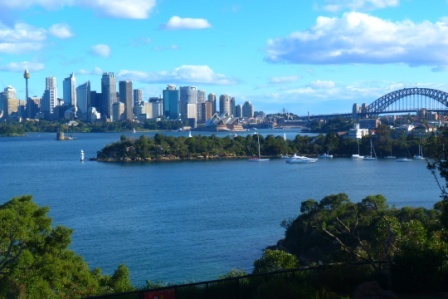 Apart from the animals, the zoo is in an amazingly scenic setting on a steep sided hill overlooking Sydney, and I have to say that the views alone are worth the visit. You can get to the zoo by walking up a hill from the ferry terminal, or taking the bus or cable car. The latter option means that you enter the zoo on a sky train passing through palm trees, as you look down over the Ellies in the elephant enclosure. Like I said … stunning. The Indigenous Cadigal people lived on and around this headland for thousands of years, until the first European settlers claimed the land. 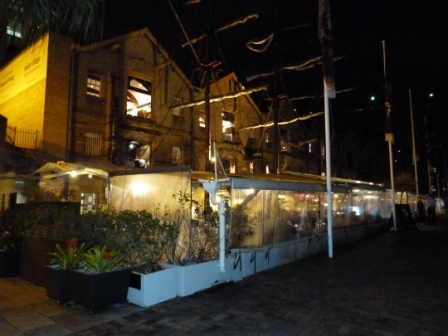 The Rocks grew from an open-air gaol into a port community and today the renovated former warehouses and sailors’ homes have been converted into restaurants, shops and galleries. Arriving from the airport about 6pm, we checked in then dashed from the hotel down to The Rocks. We were bedazzled by the sun casting its last fiery slashes of colour above the Opera House and Sydney Harbour Bridge, but were somewhat shocked at the prices of the snazzy restaurants down by the Overseas Passengers Terminal. A little gobsmacked we walked on and took photos of the historic buildings that whispered of life 100 years ago, had a nose at the menus of some idyllic al fresco restaurants under tented sails and then opted for a small Italian restaurant along George Street where it was cozy and welcoming on a chilly winter’s evening and offered less expensive but tasty pasta. Look out for the large-scale street murals that capture actual views from the past. Well, we didn’t’ get there, but if we’d planned a bit better, done less shopping and less gazing at the harbor, then eating in Chinatown and exploring was definitely something on the “To-Do” list. You can shop all over Sydney, but my daughter had been told to go to Bondi Junction. And shopping was at the top of my retail therapy deprived daughter’s list. I cringe a little in the telling of this … If the truth be known, I use her as a decoy for my own lust of pretty things to purchase. “Let’s not go shopping for too long,” really meant, “Take your time darling, I’m right there with you.” As was evident by the armfuls of clothes in the changing room. There are stacks of shops (and labels) to keep Mum’s and daughters happy in the large mall at Bondi Junction in the east of the city, and also along Oxford Street. Uh Oh! We were too busy trying on clothes to get here. And too knackered after all the shopping! Though I have to say that coming from regional Western Australia also meant that our sore footed concensus was – head back to the city for wine, or see a beach (in winter) which probably, sorry Sydney, despite its reputation, doesn’t match up to those we have in the South West. If you don’t have pretty beaches backed with a full social scene where you live, then you should probably make a point and get to Bondi – it is famous. A walk around the historical parts of the city. We stayed at The Travelodge Wynyard in York Street (verdict: Comfortable, a little tired, no free wi-fi in the bedrooms or reception, but a great position in the city centre and a good price when booked over the internet.) 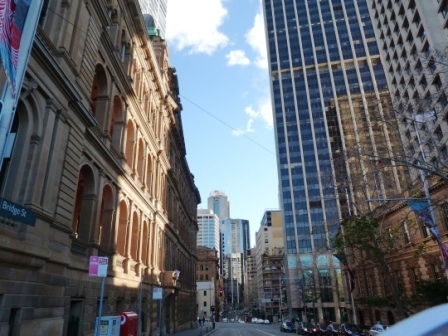 If you are travelling to Sydney have a look around for accommodation deals, and if you’re perhaps looking for last minute accommodation, visit the Quickbeds website for a selection of great rates and places to stay. It’s not of course. Not much at all, but it’s easy on the eye and the older buildings ooze a history that I’d love to explore some more. Sydney-siders! I apologise not if I’ve left out sights that you consider important for first time visitors. I’d love your ideas though on where to go and what to see, both for Zigazag’s readers and for My Next Visit (let it be soon please). Anyway, I shall definitely be back … Have you been? What do you recommend? Please let others know in the Speak Your Mind/ Comment/Reply box below. Visiting the Zoo? Look out for off season specials that include a Hop on Hop Off cruise around the harbor. Bondi Junction – Number 333 or 360 Bus – Prepay for your ticket from participating newsstand kiosks (We bought ours near Martin Place Station). Photograph the Opera House and Sydney Harbour Bridge at sunset, then turn around and click the city as its high rise buildings sparkle with lights of many colours. We found that the eateries around the Opera House are less crowded in the early evening – before 7pm. 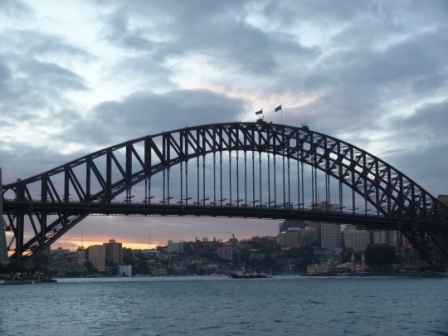 Yes you can climb Sydney Harbour Bridge if you’re in search of an adrenalin rush and a magic view. Try Bridge Climb. There are a couple of options, and I’d advise booking in advance. Crocodile Dundee Eat Your Heart Out! 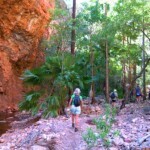 Outback highlights in North Western Australia. Nuffnang Blogopolis and Blogging. If you snooze, you lose! Great list of things to see and do, Jo. Sydney is such a fabulous city. I only had half a day free to do some sightseeing but loved the walk around Circular Quay past the Opera House and through the Botanical Gardens. I must go back to the zoo. It really does have some of the best views of Sydney! 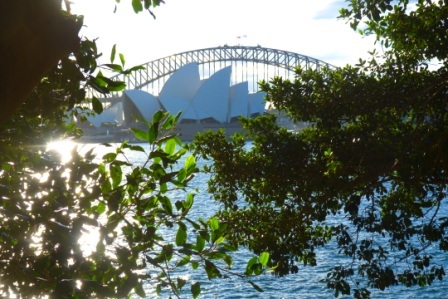 I think if you only have a short time in Sydney, the walk you did is a must – it’s so pretty – and the zoo, oh yes! Imagine living in a house up there! I see they are offering overnight accommodation there now too – snore to the roars! We also stayed at Travelodge, but at the Corner Wentworth Avenue and Goulburn Street. It is also a very nice hotel. Sydney is very pretty, and Taronga Zoo is great fun – if you’re into photography then leave lots of time, because there are amazing photo ops to be had! Hope the photography is going well 🙂 And thanks for popping by in your busy schedule. 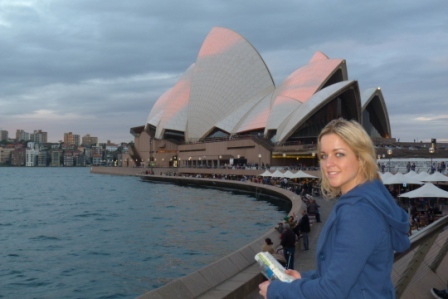 Sydney is such a wonderful place – I loved it as a tourist! so vibrant and just LOVE the harbour, the shopping, the cafes and restaurants and the night life. Great post Jo. We were just saying the other day we wouldn’t mind going back to Sydney, as it has been a few years since we were there. Thanks for the great newsletter also Jo. It sounds like you had a great time at the blogging conference and came back full of enthusiasm. I will certainly be checking out some of the links. I hope you manage to get back to Sydney soon and rediscover some of its hot spots. Thanks, Jill – yes we had a great time, and the blogging conference was amazing. I’m so glad you enjoyed Zigazag’s July newsletter – it’s brilliant to get feedback and to know that people do check out the links. Let’s catch up soon, soon. Sunset at the Opera House sounds absolutely beautiful, and I also like the sound of a walk through the historic district. I like the contrast between the old architecture and modern glass structures. 🙂 Will have to make it to Sydney soon! Hope you do! It is a beautiful city. Thanks for dropping by. I live in Sydney but still go into “town” occasionally. My trips usually coincide with some weekend chore I wish to avoid(like painting). I tell the missus I need to get out of the house for some fresh air. Fortunately I can hop a train from Lewisham into the City and be there in less than 10 minutes. My routine trip would be to detrain at Circular Quay and wander round to catch the didgeridoo players just on the corner before the Museum of Contemporary Art. A stroll through the Rocks markets is followed by the ferry ride to Darling Harbour where I grab some lunch.The Maritime Museum still has free admission!!!! A walk through the Chinese gardens is good but not something I would do every time.Time then to head to Paddys Markets to look at stuff not to buy. From there it is an easy perambulation to Central station and home, but on a hot day a cleansing ale or two in the Irish pub is not without merit. Some great tips there Keith, thank you. Shall definitely keep your ideas in mind for my next visit. The markets sound like a lot of fun, and the Maritime Museum would be interesting.